On April 12th 2018, the first Research Software Engineers (RSEs) for geosciences meeting was held at the European Geophysical Union (EGU) General Assembly (GA) in Vienna, Austria. The EGU GA is a huge event with over 15.000 people from more than 100 countries. It has a diverse programme with thousands of posters and hundreds of sessions, but what it lacked was an event to bring together scientists who contribute to research software. Daniel Nüst from the Institute for Geoinformatics, Germany, proposed the idea of such an event to a group of regular EGU GA attendees from the German RSE chapter. He was joined by Martin Hammitzsch (GFZ eScience Centre, Germany), Bernadette Fritzsch (AWI, Computing and Data Centre), and David Topping (University of Manchester) as co-conveners for a Townhall Meeting “Research Software Engineers in the Geosciences”. Townhall Meetings, or “townhalls”, are union-wide events. They allow participants to take part in open discussions covering a variety of topics. Townhalls take place in the evening after a full day of regular conference and poster sessions, so the motivation of people showing up is unquestionably high. For the RSE townhall, it was difficult to stand out in the programme, it being a first time event at a large conference cutting across many domains and 24 divisions, from biogeosciences to seismology and paleontology, with over 600 sessions over the course of a whole week. But searching the submissions some weeks before the assembly for “software”, it seemed clear that software plays an important role for scientists attending EGU as it does of any researcher, so the conveners were hopeful to welcome a few people. And they did! About 40 people from 7 countries representing the wide range of EGU divisions joined the meeting. It was a good mix of seasoned RSE folks and early career scientists as well as senior researchers for whom the topic was relatively new. The meeting kicked of with a short welcome by the initiator, Daniel, followed by Jens Klump (Science Leader Earth Science Informatics at CSIRO, Australia), Deputy President of EGU’s ESSI Division and advisory board member of the Australian and New Zealand chapter RSE-AUNZ. Both pointed out the relevance of contributions to science made by software and thereby the people contributing to that software in any way. The motivations for national and international RSE activities were further detailed by three representatives from national chapters. David Topping from UK RSE, the oldest and largest RSE organisation, took a look at the definition of an RSE, at the community history, and its current state in the UK and beyond. Over 15 local groups already exist and more are forming at a high rate, sometimes even competing over members. Martin Hammitzsch presented the German chapter, de-RSE. Initiated only 1.5 years ago, he shared the group’s objectives, how they work to build a community, challenges they face and some lessons learned: a great resource for the attendees from countries without any organisational structure yet. Third up was Niels Drost (Netherlands eScience Center), who introduced the youngest European chapter NL-RSE and its core team, which already generated a considerable reach across the Netherlands. After the short talks, we took advantage of the group size, had a complete round of short introductions, and enganged in a discussion. We found that one of the big challenges was to reach people engaged in Research Software Engineering (RSEng) activities at their work, especially outside of ESSI, and those for whom the “RSE” label does not ring a bell yet. 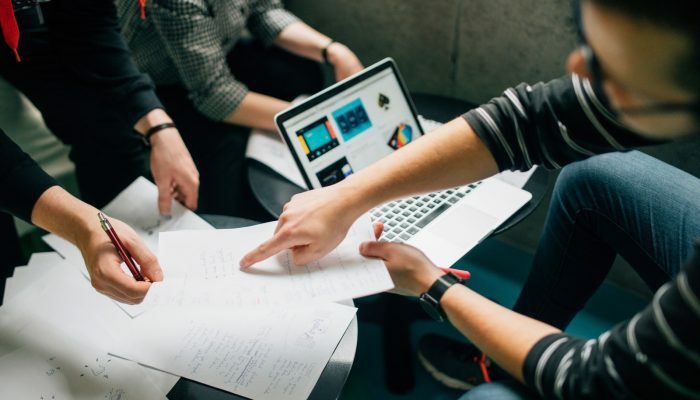 The need for outreach also applies to holders of an office within the union, to reach better acknowledgements of the needs of RSEs in universities, scientific unions, and at scientific conferences. Some good ideas came up and we plan to reach out to EGU and ESSI leadership and share them. For example, EGU could increase recognition of RSEs and their work by awarding a medal, by offering a special poster track for contributions to scientific software (allowing an additional “software submission” per author), or by tagging abstracts as “RSE” similarly to the “ECS” labels. These are ideas for “top-down” activites that we would like to advocate within the organisation. The usefulness and overall potential of such domain-specific (taking all EGU members as a group for a moment) actions, who are lateral to the national chapters, was commonly agreed on. But there were also ideas for “bottom-up” activities which can support the RSE organisations’ causes, for example scientists organising sessions related to RSE roles and activities within their divisions, offering short courses specifically around RSEng capabilities (and also labeling the numerous existing courses as such), or organising software and data carpentry courses in the week before or after the conference. One participant suggested a session “Software development for professors – what do my students do with their computers?”, which seems funny at first, but at a second look goes to the heart of RSE outreach activities for raising awareness and teaching software-related skills. It was great to follow the lively discussions, which were enriched with a common understanding of the values and importance of diversity and openness. If you think about convening a session on scientific software yourself at an EGU GA, please get in touch! 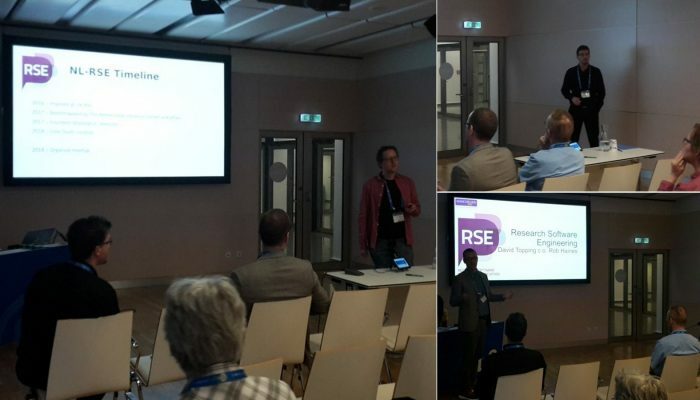 The townhall meeting was a good start to spreading the word about the goals of RSE organisations and the activities to put Research Software Engineering on the map of all stakeholders in science, such as researchers, publishers, funding agencies, and scientific unions. What can we do better next year? Hopefully we can do what more “established” townhalls can offer: snacks and drinks! We should also announce and prominently place a sticker table. Apart from that, this first townhall did an excellent job, just like other long-running townhall meetings at EGU GA: It provided a place for like-minded people to connect and for newcomers to dip their toes into a new topic and be introduced to members of an international friendly community of dedicated people who “do science with code”. The slides (download all slides here) include many links to further resources on the history and state of RSE-related activities. Please let us know what you think on Twitter: #egurse. See you at the RSE Townhall Meeting at EGU 2019! A new statement on good practice in the evaluation of researchers and research programmes has been posted by three national academies (Académie des Sciences, Leopoldina and Royal Society). The number of presentations from ECS in the ESSI sessions has been low during recent EGU General Assemblies. We are hence currently trying to get greater involvement and recognition for the ECS in the ESSI Division. How to get involved as ECS in the ESSI division? We have a dedicated ESSI ECS mailing list that can be used for discussion between the ESSI ECSs. It is also used for announcements, such as dedicated meetings at the GA 2018. As mentioned above, we aim to have more ECS presenters in the ESSI sessions. The call for papers has just been published and contributions from ECSs are welcomed and encouraged. A description of how to submit an abstract is available here. ECSs can also apply for travel grants. Detailed information on travel grants is given here. Have you already been at previous EGU GAs? Then you can volunteer as a mentor for ECS who are attending the GA for the first time. Alternatively, if it will be your first EGU why not sign up as a mentee and gain some insider knowledge on how to get the best out of the General Assembly as well as building your network of contacts. Do you have some news on your own research and/or on topics relevant for other ESSI ECSs? You are welcome to contribute with your own posts to the EGU ESSI blog. If you’re interested please contact us directly. We are planning to organize online meetings for ESSI ECSs. These meetings are used to get to know each other and to discuss questions and answers. The online meetings are announced on the ESSI ECS mailing list. General information and background material for ECSs is available on the general EGU ECS website. If you are having ideas for the ESSI ECS community or are having any questions, feel free to use the mailing list or contact us directly. Like everyone else, in the beginning I was skeptical of the newly introduced presentation format at the EGU – the PICO sessions. 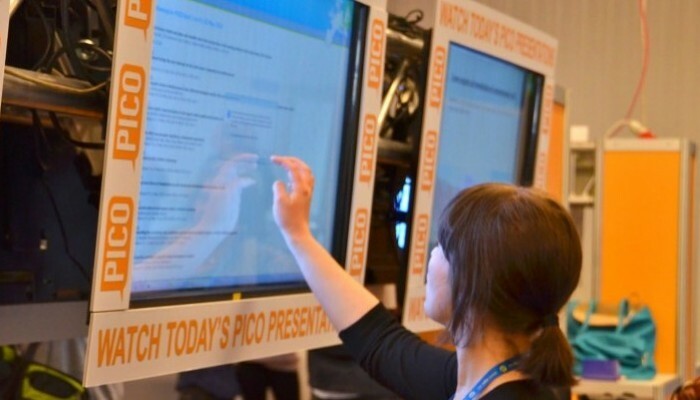 PICO stands for Presenting Interactive Content. Half talk, half poster – this is a new design that demands a completely new and unfamiliar preparation of the presenter, and yes admittedly at first this meant additional work. However, already during the creation of my first PICO presentation, I realized that the scientific content can be filled with much more life than in a poster, and with much more information than in a talk. This made me change my opinion quickly. Before the PICO gets presented, the presenter has the chance to advertise it in the so called ‘2-minute madness’. Usually they are less crazy than it sounds, but the idea is great – to force scientists to minimize the story to the key facts. Let’s be honest, nobody reads all the abstracts in the program. So with this short advertisement the scientists have the chance to get more uninformed people into visiting their research. Later, during the PICO session, I noticed that most attendees are keen to hear more about your scientific adventure. This means, it starts like a regular oral presentation. However, pretty soon, the people start to ask specific or sometimes very specific questions like with a poster. Then you have the chance to guide the presentation into another direction, but you still have your supporting tools at your fingertips – like videos, animations, high resolution graphics, large tables, etc. Next, the questions lead into a conversation and quickly transform into a discussion, which usually attracts other scientists. A big advantage is that questions are asked at the very moment they come up, while presenting the respective slide and do not need to wait until after the talk. For me the PICO sessions are a valuable addition to the traditional formats. What is missing? Maybe the possibility to access websites as well. Maybe a session mixture of talks, posters, and PICOs. Anyhow, I think particularly the ESSI division should push for PICOs. I cannot think of a better format to show results like in posters or talks, but at the same time have the opportunity to dig much deeper into e.g. programming languages, IT infrastructures, visualization, etc. And it is a perfect showcase of how nowadays topics – in this case scientific presentation types – are positively influenced due to informatics. ESSI should be upfront with these developments as well. Please watch the non-interactive PICO presentation here. The interactive version was uploaded to the EGU site. Welcome to the blog of the Earth & Space Science Informatics (ESSI) Division of the European Geosciences Union (EGU). This blog serves as a platform for the ESSI community to share news, events, and activities, as well as updates on the latest research being undertaken in our field. We also hope this blog will serve as a discussion forum. The blog is run by Jennifer Roelens, Anatolii Chernov and Julia Wagemann. Everybody is invited to contribute to the blog and submit posts to the editor Jennifer Roelens .